So, my friend Beth was over for dinner last night and instead of just sitting on our butts and talking about food, we figured we’d make some. 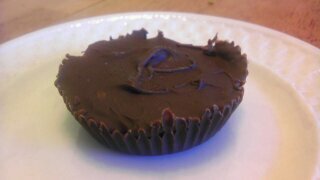 After realizing I was out of shortening (I know, I’m a terrible person) and we couldn’t make cut-out cookies, we had the genious idea to make peanut butter cups. After doing a little searching on Pinterest, (I ❤ Pinterest. It’s where I find almost all of my recipe’s now.) we found the recipe to try. Added the peanut butter and started filling the muffin liners in the muffin tin. The hardest part for us was waiting while they sat in the freezer. But, oh my goodness, they were SO worth the wait! pinch of salt (we forgot the salt, but they still tasted great! Place chocolate chips in oven safe bowl and put in oven. Keep your eyes on the chocolate and stir occasionally until chocolate is completely melted. (you could also melt the chocolate in heavy-based saucepan or double boiler, but this method works great! After the chocolate is melted, add the peanut butter and salt and mix until all is melted and a good consistency. If you need to stick it back in the oven for a couple minutes, go for it. It’s easier if the chocolate is meltier to put it in the muffin liners. Place 2 teaspoons of the chocolate mixture (we guessed on the amount, but ran out at the end when we were covering the PB with the chocolate) and use the back of a spoon to spread on the bottom of each liner and up the sides, just a bit. Place these in the fridge for 20 minutes or freezer until the chocolate hardens. Prepare the filling while the chocolate is hardening. *Don’t forget to keep the rest of the chocolate melty! Mix together the peanut butter, powdered sugar, and salt. Place 1 heaping Tbsp of peanut butter mixture in each muffin liner and press down with back of spoon. You don’t have to spread it, cause you want the chocolate to cover the PB in the next step. Place the muffin tin back in fridge/freezer. When the PB is hard enough, take out of freezer. After covering them all, place back in fridge/freezer until chocolate is hard. NOTE: we used part milk and part semi sweet chocolate chips for this batch. I made a second batch the next night with all milk and it turned out even better than the first!